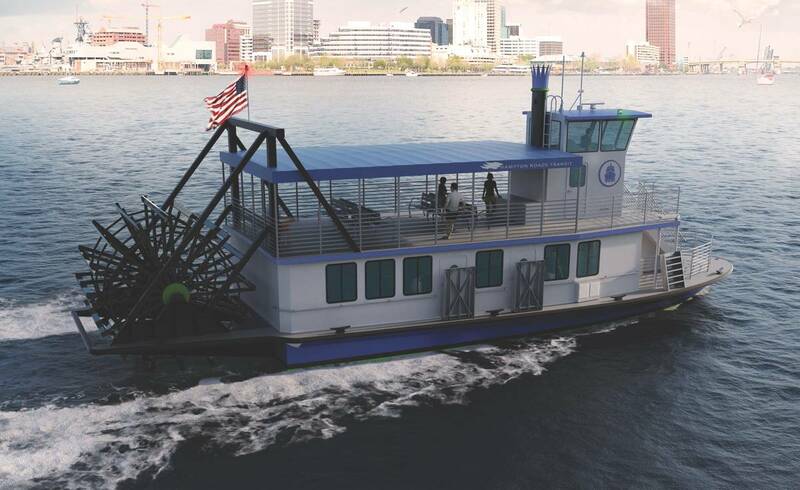 When two new Elizabeth River passenger ferries enter service in early 2017, passengers will not likely give thought to the engines powering the vessel, but they will appreciate the outcome – a smooth and quiet ride. And the ferry operator, Hampton Roads Transit, will appreciate the reliability, fuel economy and easy maneuverability provided by the propulsion plant from Volvo Penta. HRT specified twin Volvo Penta 13-liter 400 hp diesel engines to power its new River Ferry IV and V to provide daily, round-trip connections between the waterfronts of Norfolk and Portsmouth in Hampton Roads harbor at the foot of the Chesapeake Bay. The two 78-ft. aluminum-hull 150-passenger pedestrian ferries were designed by BMT Group and are being constructed at Armstrong Marine’s shipyard in Swansboro, N.C. River Ferry IV is poised for delivery by the end of 2016, while River Ferry V will launch in the first half of 2017. “Volvo Penta engines are known for their low noise production and pure performance,” said Tracy Gable, contract administrator at Armstrong Marine. “These engines will provide a quick, reliable and easily maneuverable ferry ride back and forth across the river.” The D13 engines are EPA Tier 3 compliant and are IMO NOx Tier II certified. They also meet the U.S. Coast Guard requirements for decibel levels in marine commercial engines. 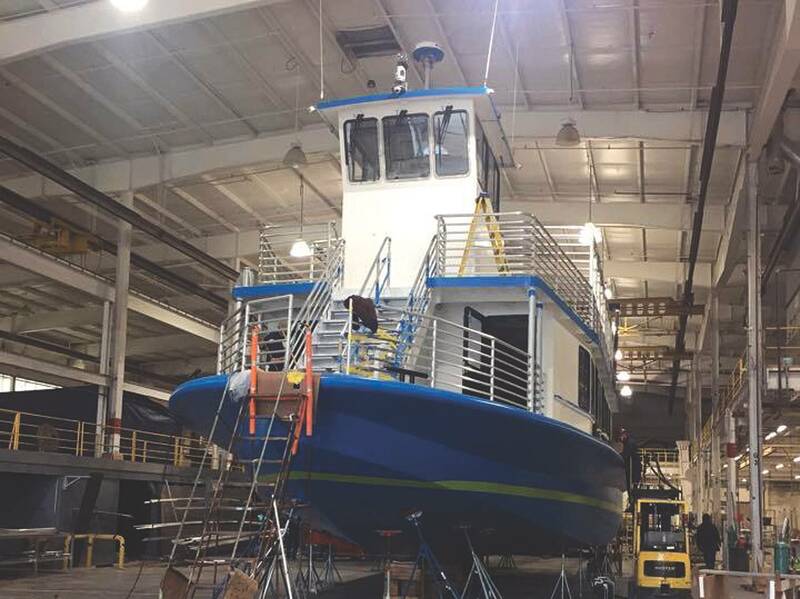 HRT repowered one of its existing vessels, Elizabeth River Ferry III, with the same propulsion package in 2014, and was very satisfied with the results – in the form of improved fuel economy, reduced emissions and high performance. Powering the new ferries is a point of home-town pride with Volvo Penta of the Americas, which has its headquarters in Chesapeake, Va., just a 20-minute drive from the Norfolk/Portsmouth ferry terminals. From its facility on Volvo Parkway in Chesapeake’s Greenbrier business corridor, the company supplies and supports engines for leisure boats and commercial vessels, as well as industrial applications. The engines are sold by 3,500 dealers in more than 130 countries. “As we grow our commercial marine business we are seeing more repeat customers like HRT who keep coming back to us because of their experience with our engines and our extraordinary engineering and customer service teams,” said Kull. Popular with the region’s visitors, HRT’s river ferries, with their trademark paddle-wheel (for show only, not propulsion) at the stern, operate every 30 minutes, with 15-minute service during summer peak times. During the summer months, they also provide runs to Norfolk’s Harbor Park stadium for baseball games.